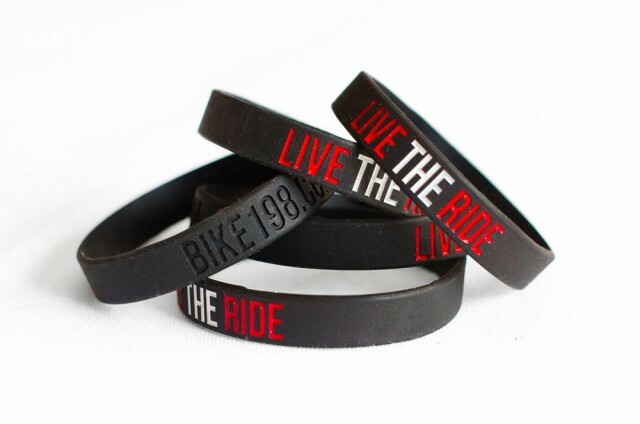 Over the past couple of weeks, I rolled out my latest product release on Bike198.com…the “Live the Ride” wristbands. Backing up – awhile back (about 6 months ago), I was trying to figure out another physical product I could release that would increase brand recognition and be easy to put together. After some thought, the idea of the wristband came up so I asked our Facebook followers what they thought…and they loved the idea. Like most ideas that are well received, this one sat on the shelf for awhile. It is easy to come up with the idea, but you have to actually follow through with it for it to become real. I wasn’t following my own action advice and eventually I decided to take the plunge. I found a company online that was willing to give me 100 bands for free if I ordered 100, so I figured that was the perfect opportunity to pilot my idea. After about 3 comps and a wait of several weeks, the bands showed up on my front doorstep from China. Immediately, I took the picture above and posted it on Facebook. The wristbands have arrived, stay tuned on how to get yours. I installed the Jigoshop plugin in my WordPress install, setup a product page [you can see it here], threw them up for 4 bucks a piece with free shipping and sent the link to my Facebook fans. The orders started trickling in and I started shipping the bands out via snail mail. The order process was working and my initial sale release was a success. It was time to hit the big list…my newsletter. The Bike198.com newsletter is composed of 15,000+ riders from around the world. Once it hit the wire, the orders really started pouring in. Now…I was expecting a rush of orders due to the email blast but I was not expecting something that ended up being really cool. No one was ordering one band at a time. Most of the orders that came through were for 2 to 4 bands. Not only did this make scaling the cost of packaging and shipping easier, but it was really cool to see people get excited about this product enough to order more than one! The smallest percentage of the orders was for a single band. So now…after the initial big order aftermath, the orders continue to come in daily and I am looking at having to make a bigger order with the band company to fulfill demand. The little, simple idea worked. What have I learned from this project? As with all things I do on this site or any other I own…there are things I take away from every situation. In the past, I have released t-shirts, jerseys and other more expensive items. While these carry a higher rate of return, they also come with a small quantity sold. If you are looking to increase brand awareness, you need as much of the product on the streets as you can get, so the low quantity is not as appealing (given that your core profit is not just from physical product). With the bands, I was able to tap into a section of the lives of my readers by providing a cheap way to show their love for all things biking while also increasing my brand awareness. I am not going to become a millionaire off this idea but it is great for my site and my goals. Right after I released the bands, I had several people say they would buy a band if the money went to charity. Look…I believe in giving to charity and we even donated half the profits of the kit sales to Livestrong, but every now and then it is ok to release a product without that kicker! At 4 bucks a pop, I am technically selling these at a loss if you factor my time into the equation. There will be some people that believe everything on the web should be free or for a cause. You have to block those out and move forward with your business plan. It is ok to profit…who wants to work for free all of the time? With this wristband, I was looking for a way for my brand to be on the wrist of riders while they road their bikes. I also wanted it to be catchy enough that other riders would ask about it. The project is achieving that goal while also putting a little bit of money back into the business. If your goal is different, you would need to look at something that carried higher profits or was free based off your needs. When dealing with physical products, you have to plan exactly what you want to get out of the deal, make sure you have an audience that will buy based off those goals and then you need to implement accordingly. Not every idea is a great idea if those factors are not considered ahead of time. Just like I did with the bands, I asked people I would eventually be selling these to if they would actually buy (Facebook was great leverage for this). That gave me a general idea on the potential success rate of the project. While all opinions before release should be taken with a grain of salt, if you get overwhelming support for the idea initially, you are generally on to something good as long as it goes with the goals you have defined. I bet you can guess that writing out all of the shipping addresses and mailing these bands is not a time efficient task. I had blocked time away to package and ship these wristbands before they actually went on sale. If you are thinking about releasing a physical product, you have to consider the back end management that will be required to actually get the product in the hands of your customers. Before I officially released the bands, I bought my own. Then…when I was sure I could get my transaction through, I sent the link to a smaller control group before hitting the big list. The last thing you are going to want to deal with is lost sales due to a broken checkout system or the inability to ship efficiently. Be sure to check and double check your system before taking everything fully live. This project gave me insight into what my readers wanted in terms of a physical product that also increased the spread of my brand. The trick is to apply what I have learned from this project and find something else that can meet the same goals moving forward. The feedback on the bands has been fantastic and I am looking forward to the positive effects they have on my business in the future. Who knows…there might be a series of these that eventually match stickers, t-shirts and miscellaneous bike components. The sky is the limit as long as you keep an open mind and actually act on the ideas you have. Previous ArticleWhat it really takes to get a smiling baby picture. Brilliant idea. I might ‘borrow’ it for one of my projects down the road. You are right, you have to allow for more work than you plan. That’s pretty awesome, Robb. I really like the idea of “Live the Ride”. Genius. Thanks Robb, I really appreciate the detailed update on how you did this. It helps with my own learning. I’m not a bracelet wearer myself, but they look pretty cool. Maybe take a look at using a fulfillment company to send out the bands – it would free up your time and they generally get much better shipping rates because they send so much out (pays for itself in the end). I’d recommend calling Brett from SpeakerFulfillmentServices.com (I’ve used them in the past and they are quite good). Either way, I love what you’ve done with this. Thanks for the heads up Stu. That is definitely something I will look into. Great idea! I was thinking of having some made as giveaways with purchase (maybe also sell), for my website. Can you share where you had yours made? They look good and I like the color combo. I’ve visited several sites but prices are all over the place. Please email me the info if you prefer. I love the idea. Robb, I really inspired by your case study on reviewing sites. I bought your Ramped Reviews and now ready to applied to one of my blogs. When I first started, I can see that I’m enjoying this review. Great job on this. You followed through on an idea. You asked your fan base, you tested, the price point sounds good (without knowing your costs…) and people bought multiple of them!